It was really nice today to have time to spin more/longer than I can manage during the week. I spun a whole bobbin today of the H57 – that leaves just one more bobbin and I’ll have finished all of it. I definitely went on auto-pilot today – and it was good right up until the end. Right about the time I knew I was getting too tired and needed to stop, I was reaching the end of the allotted wool for that bobbin so it worked out well. I want to make a comment about yesterday’s plied yarn, now that it’s dry. It’s the best yet. 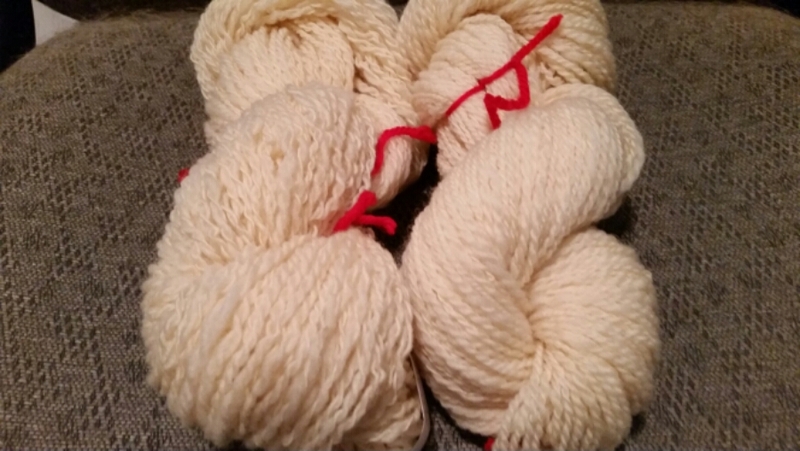 The difference is in the plying – it’s much tighter (in a good way). You can see this in today’s picture – the one on the right is yesterday’s, and you can see how much more “together” it looks than the one on the left, which was the previous plying. I had tried putting more twist into the ply this time, and I like the result. My next thing today will be to go look in my knitting stitch dictionary and pick a couple to try for this yarn, and knit myself a swatch or two. This entry was posted in Art, Fiber and tagged Arts, beginnings, creativity, Honesty, Spinning. Bookmark the permalink.